Gone are the days of carrying digital cameras around your pocket as well as huge bulky camcorders just to take wonderful pictures. With modern smartphones, you can take a snap of everything in just one click, record every single moment and all pictures are automatically saved on the photo gallery. From wonderful photos to unforgettable videos, indeed these smartphones have changed the way we take and keep pictures. But there are many reasons behind accidental photo deletion, it can be a corrupted memory, phone reformat, buggy OS version, viruses, system crash, rooting error or syncing problems. Luckily, there are simple ways on how to recover deleted photos from Android phone. Check them out after the jump. It’s hard to retrieve deleted photos from Android especially if you don’t have the technical knowledge about the OS. But with recovery software such as Android Data Recovery, retrieving those precious moments could be few clicks away. This application can recover photos, videos, contacts, messages, call logs, audio files and other mobile documents. It comes fully compatible with almost all versions of Android whether rooted or not rooted. Connect your Android phone to PC using USB cable. Make sure to enable USB debugging mode. On PC, click “Android Data Recovery”, check “Gallery” and then tap “Next”. Choose “Scan for deleted files” or “Scan for all files” to find your files, you can also choose “Advanced Mode”. And click “Next”, then “Start”. When scanning accomplishes, select items you want and tap “Recover”. To ensure the completion of scanning, do not disconnect the device during the procedure. And after the process, you can get deleted photos on your computer and transfer them to your Android phone. Another tool that can recover deleted pictures from Android is FonePaw. This program can also retrieve contacts, messages, call logs, videos, audios and mobile documents. It supports multiple brands of Android phone from HTC, Sony, Google, Samsung, ZTE, Huawei, LG, Motorola and many more. Preview of data before actual recovery is likewise available so you could precisely restore what’s only needed. Install this program on your computer and open it. Link Android device with the computer via cable. On the home screen, there are several categories, choose “Gallery” for camera roll or “Picture Library” for photos from apps and browsers. Click “Next” and wait until the scanning process completes. 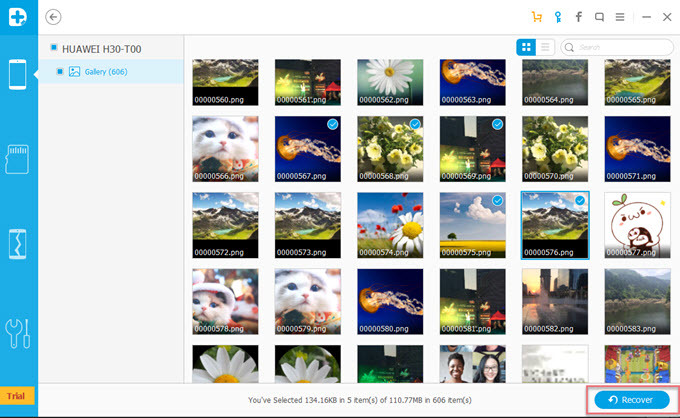 From the result page, select the photos you wish to restore. Click “Recover” to save them back on your computer. 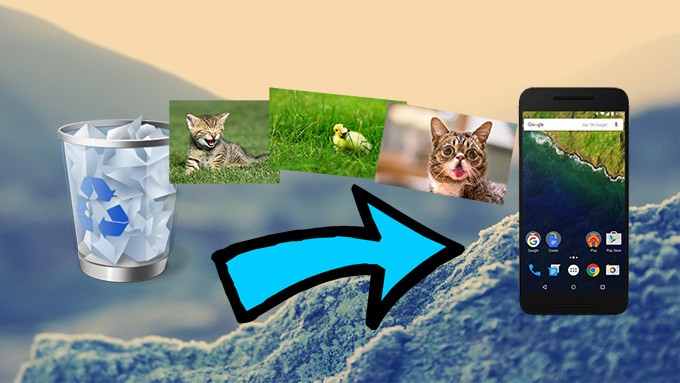 Now that you know the tools that can efficiently retrieve deleted photos from Android. Always make sure to keep a backup copy of all your pictures, so that when the unexpected thing happens, your files are safe. You can do this by periodically backing up your phone or copying pictures from your phone to PC. But if you don’t have the time to do so, one app can save your time. AirMore is a one-stop phone management application compatible with both Android and iOS smartphones. You can use it to effortlessly transfer files from your phone to PC and vice versa. It can also take phone screenshots with just one click and project phone’s screen to PC in different modes. 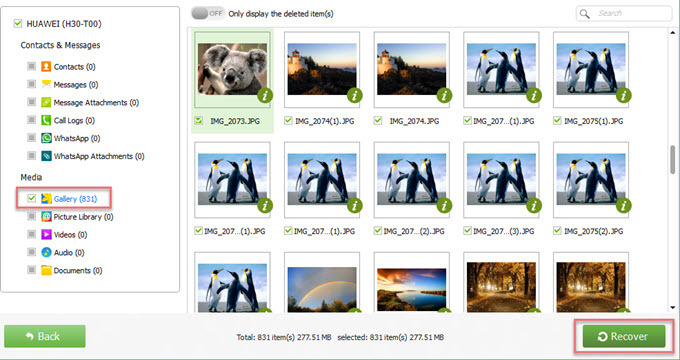 After you recover deleted pictures from Android, you can use this tool to effectively manage them without any hiccups. But what makes it wonderful is that you can use it to transfer all valuable mobile data without USB connection. Best of all, it is web-based app that needs not to be installed on your computer! Rating: 4.3 / 5 (based on 49 ratings) Thanks for your rating!